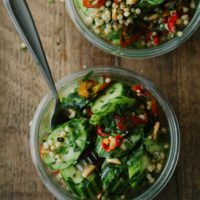 Cucumber Sorghum Salad | Naturally.Cucumber Sorghum Salad | Naturally. Cut the peppers into ¼” thick slices, leaving the seeds in as desired (they are not hot). Heat a pan over medium-low heat and add the pepper. Cook until the peppers are tender then add the garlic into the pan. Cook for another couple of minutes until the garlic is golden. Slice the cucumber and place in a bowl along with the sorghum and cooked peppers. Add the chopped herbs and measure in the olive oil, lemon juice, and salt. Toss to combine. Taste and add salt as needed. Tips + Tricks: Sorghum takes a bit of time, it’s best to cook ahead of time.